Here’s a fantastic no-bake-er which can be nibbled on for dessert, with coffee, with a pot of tea or a glass of something stronger. Rich dark chocolate, crunchy biscuit, juicy fruit and just a hint of alcohol – or not, your call – you can easily customize this to your own particular tastes and glam it up with a generous glug of your booze of choice or omit it completely and use fruit juice instead for a family treat. I’ve made this one using preserved ginger with some ginger wine, but any combination of dried fruit and alcohol would work – cherries and cherry brandy, rum and raisins, sultanas and orange juice, cranberries and raspberry juice. If the fruit is on the dry side, then soak it in the alcohol/fruit juice for 30 minutes beforehand. It’s a great make-ahead biscuit and will sit in the fridge quite happily for several days if needed, with just 2 minutes needed to tweak presentation. The high proportion of biscuit means that, whilst the flavours are full and indulgent, each slice isn’t over-rich.This might not hold true if you scoff half the slices in one sitting, so don’t *wags finger* – even though you will be very tempted. Best of all it looks like a salami! Of course you don’t have to tell people it’s sweet at all – more left for the non-cook that way – Nom! 75g crystallised ginger in syrup – drained and chopped weight. Tear off a generous strip of kitchen foil and grease it with butter. Put the chocolate, butter and syrup into a saucepan and heat very gently until just melted. Break the biscuits into a bowl – don’t break them too small as you want to be able to slice through them when serving. Remove pan from the heat and stir in the chopped ginger and the ginger wine. When fully combined, add the broken biscuits and gently fold them together until the biscuits are fully coated with the liquid chocolate. If the mixture looks a bit loose, add in a few more biscuits. Pour the mixture onto the greased foil and shape into a rough log. Roll the foil around the mixture and press the foil around the mixture into a smooth log shape. The creases and folds of the foil will help give the chilled biscuit the appearance of a salami. Twist and fold in the ends and place the roll in the fridge to set, preferably overnight. 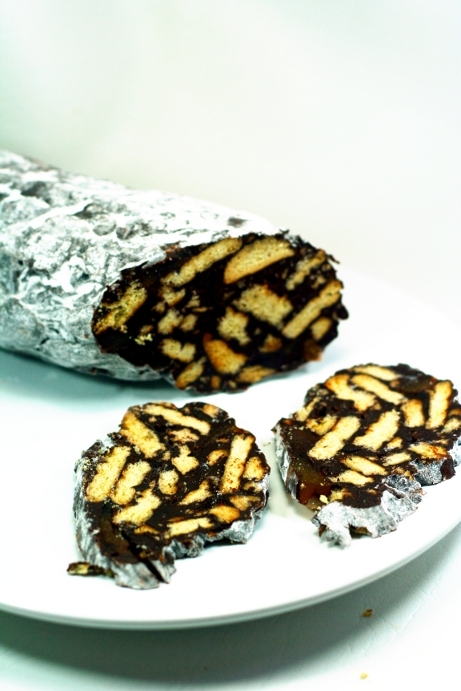 To serve: Remove the foil wrapping and dust the chocolate salami with icing sugar. Make sure you rub it in to all the nooks and crannies – it’s amazing how this simple act transforms the roll into what appears to be a genuine cave-aged saucisson sec! Use a sharp knife to cut thin slices from the roll and arrange on a plate. Alternatively, serve it uncut and see who is fooled! If making this for children, think about increasing the proportion of milk chocolate and reducing the amount of plain chocolate. Keep 230g total. If you live in the UK, Rich Tea biscuits are perfect. Digestives are too crumbly and have a little too much fat in to hold together while the salami shape is being formed. This situation, however, will not be the case with chocolate salami. Looks divine, will definitely be making it! This looks wonderful, what a brilliant idea. I might try it with amaretto. This is definitely one my son will enjoy making. He’s not a tot I stand on a stool and allow to bake with me anymore, he’s 16 and bakes in his own right.